I love taking a look inside other people’s boats given the opportunity. Each one is so unique and I love to see the different ways people make their boat's their home. 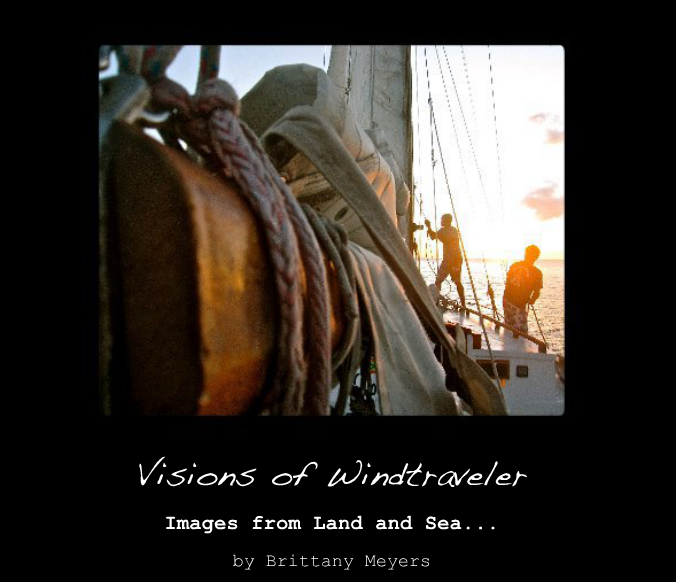 I think this desire to “look behind the curtain” is pretty common among boaters, as most sailors love a good peek 'down below'; there is always a new boat hack to be learned, interesting gadget to check out, and, lets face it, there’s something intriguing about seeing how folks make the most out of a tiny space. I always enjoy how people express themselves in the decor (or lack thereof) of their boat, and the stories their boats tell. And so now I want to show you ours. 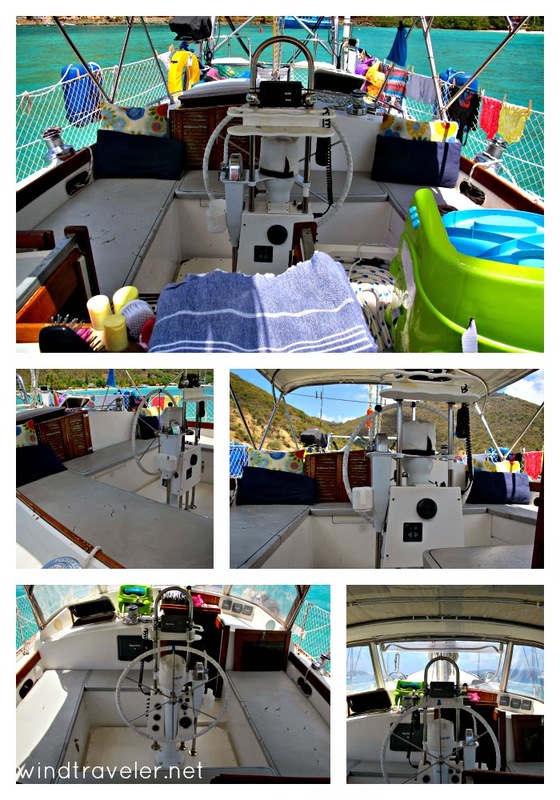 As our boat is not only a cruising boat, but our home, I have done my best to make it first and foremost, functional, but also comfortable and welcoming. 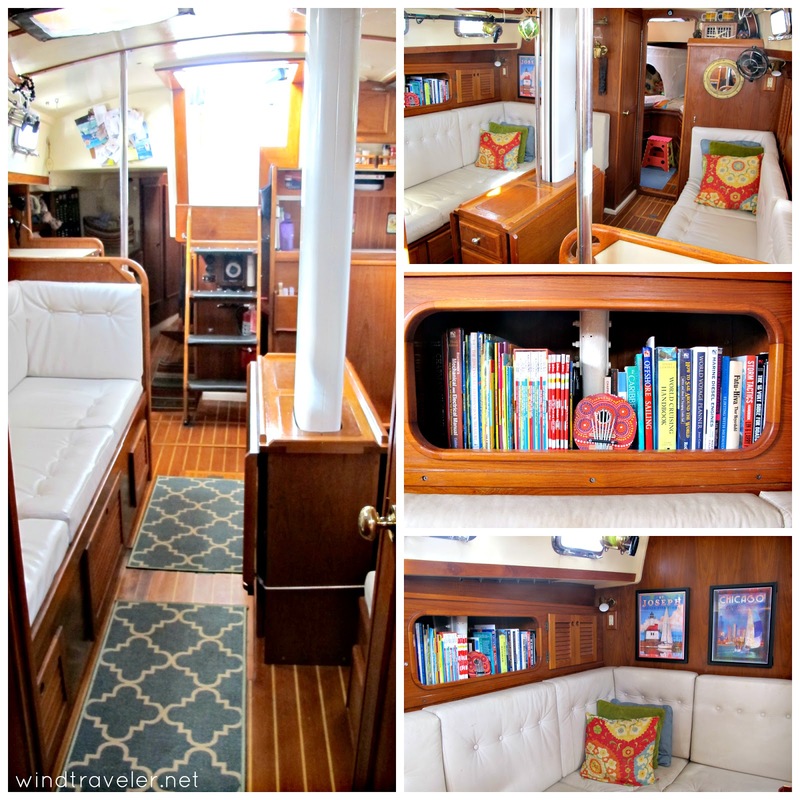 I have written about the art of making a boat a home before, but times - and decor - have changed since then, so I thought I’d revisit. It's been a work in progress and I really love how she looks and works down below. 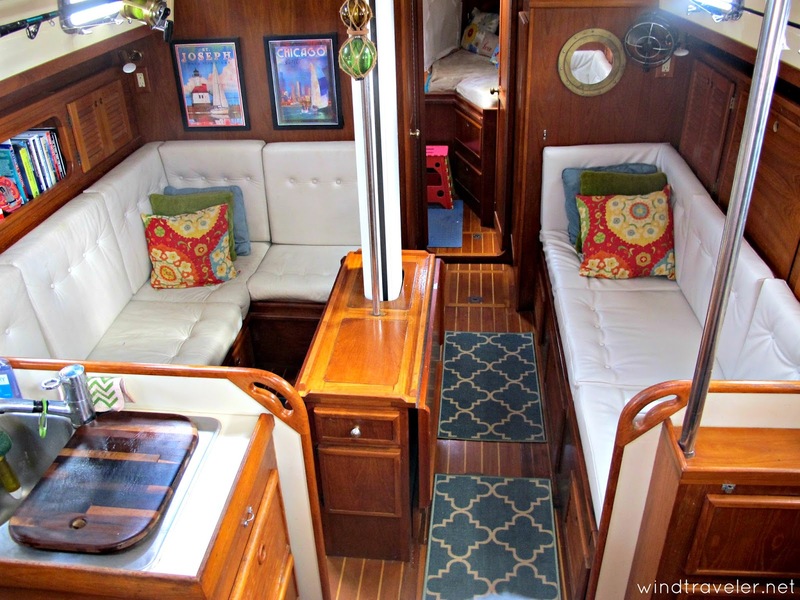 As comfy as she is, her decor is also super functional...when we are sailing, everything stays put and we don't have to worry about projectiles and general mayhem down below. Living in this boat's belly is cozy and, despite being a pretty tight space for a family of five, enjoyable. 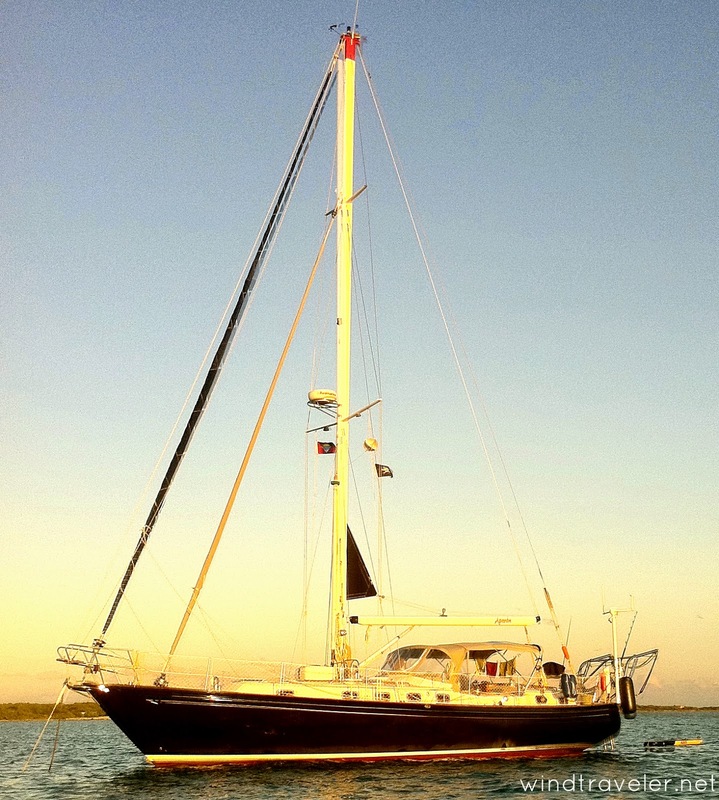 For more technical information about our boat like what make she is and why we bought her, please visit this page. But for the grand photo tour of how she looks today, stick with me. Starting from up front, this is called the "v-berth" and is where the twins, Haven and Mira (Meer-ah) sleep. You can read more about how I designed our girls' sleeping arrangements here, but the twins really enjoy sleeping and playing up here. I wrote about decorating their room, specifically, here. I really, really love how it turned out. They seem to like it, too. Here are some more pictures of their sleeping space. 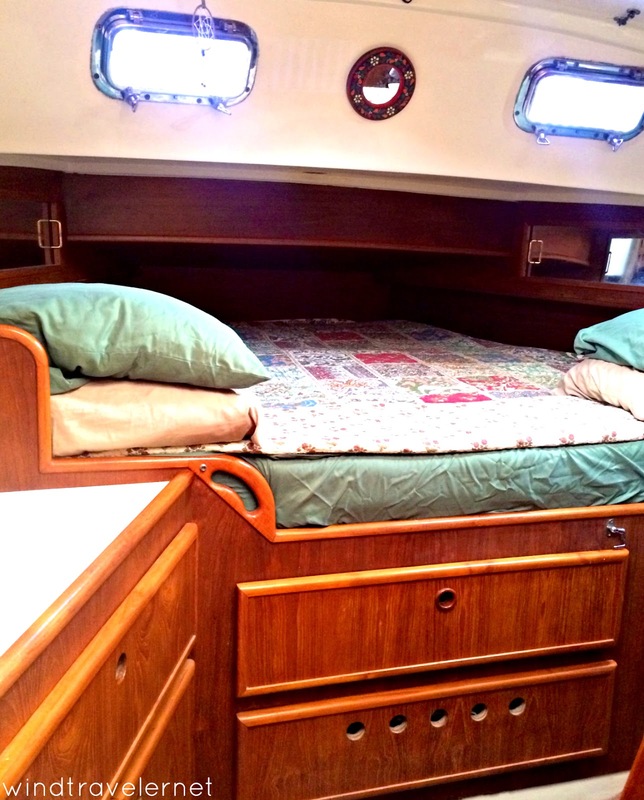 To the left (port side) is where both girls sleep, together. They have a few stuffed animals (including their beloved lovies) and snuggling blankets in there. It's roomy and cozy. 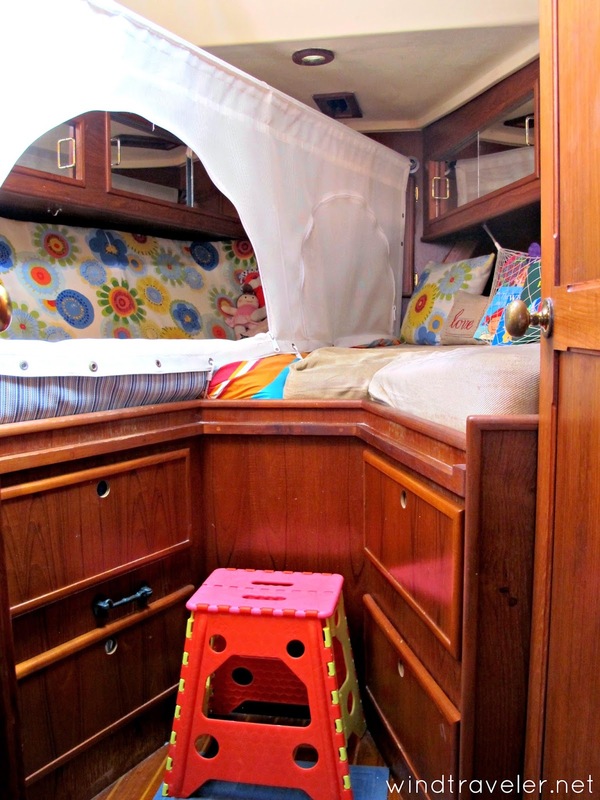 On the right (starboard side), is a small gear hammock for their books and a few stuffed toys. The mirrored cabinets above this are where all of their clothes are stored. I have a portable changing pad that I put down in this space to change diapers as well. Who says you need a changing table?! 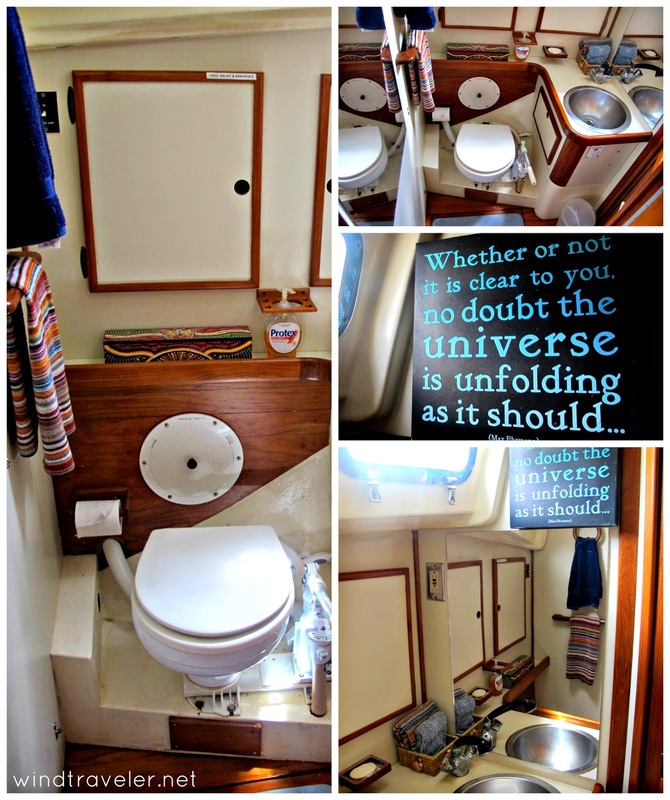 Connected to the v-berth is an ensuite bathroom, or "head" as we boaters like to call it - which can be accessed from both the v-berth or the salon (there are two doors to it). It's small and simple, but it works and has plenty of storage for most of our medicines and spare toiletries. It is also where my most favorite quote in the world lives. If you don't know this quote, you should definitely read Desiderata. 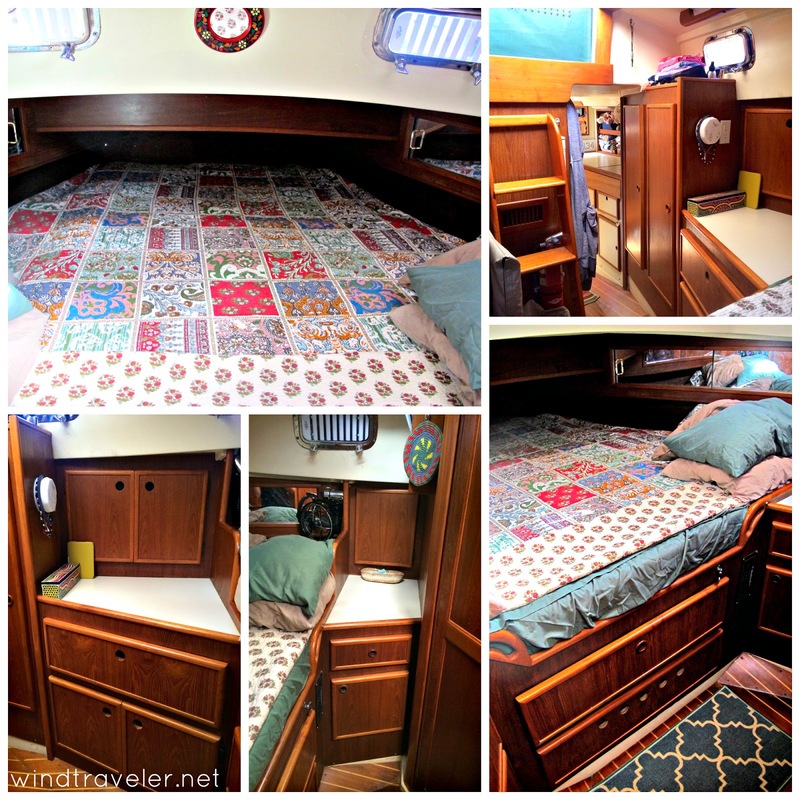 Moving aft of the v-berth is our main living space, often called the "salon" or "main cabin". I love how bright and airy it feels, something that's not always easy with a monohull where you are technically living "below ground". To the left are all our physical books which are mostly reference guides and children's books since Scott and I have e-readers. Underneath and behind all those white cushions you see is storage. Tons of storage. We keep food, beverages, spare parts and all sorts of stuff in those compartments. 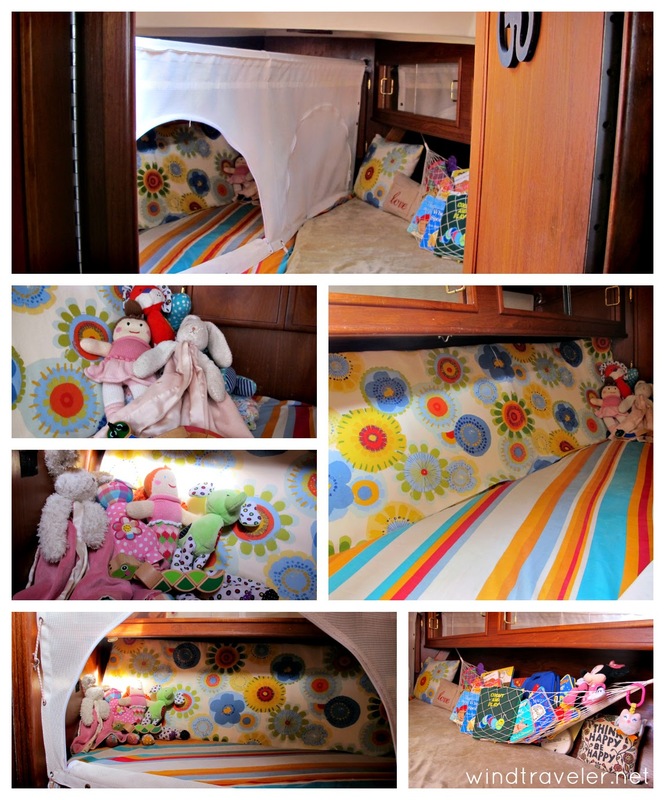 Also worth noting (because everyone who sees pics of our boat asks "How do you keep those cushions white with small kids!?! 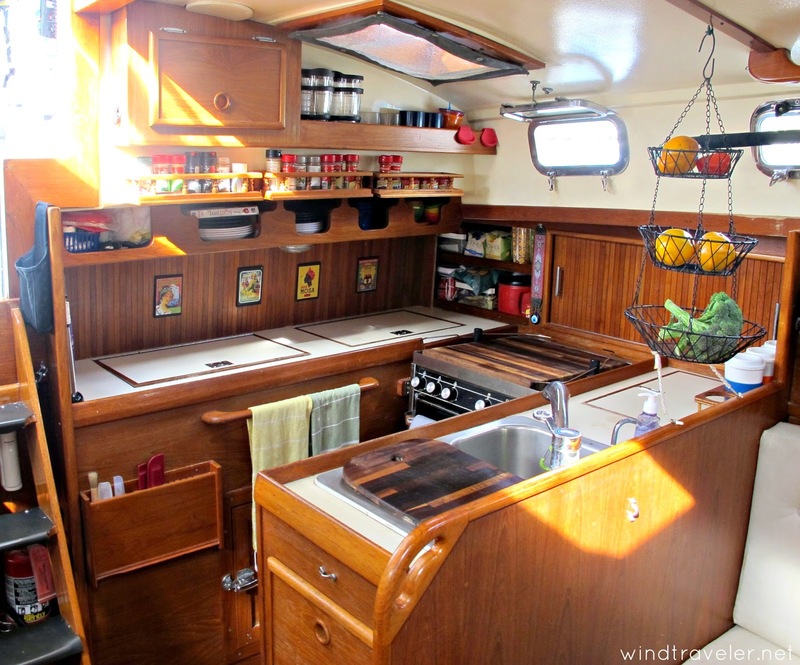 ), the cushions are made of vinyl (starboard) and ultra-leather (port), meaning anything that gets on them - from markers to spaghetti sauce - wipes right off, piece of cake. Pretty clutch if you have small kids aboard. (Note: They are different materials because when we reconfigured the salon seating, ultra-suede was too expensive so we opted for vinyl). Here are some more pictures of our salon. The picture on the left is looking aft (back) from the v-berth, the others show the salon from other angles. "A place for everything and everything in it's place" - that's my motto down below. Keeps life tidy and simple. 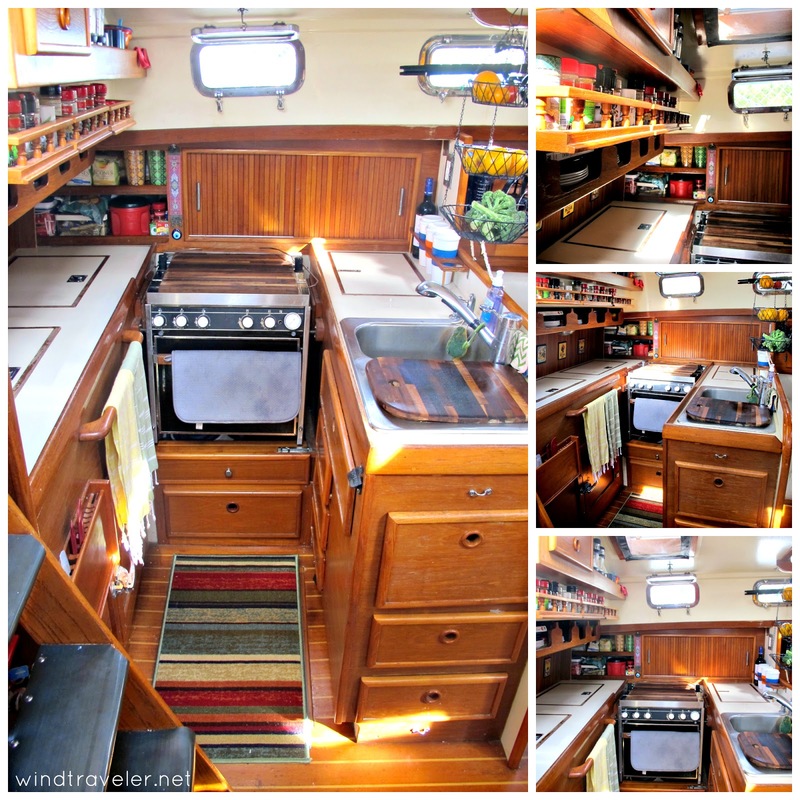 Here are some other views of our galley. As much as I really hate cooking and everything related to it (provisioning, grocery shopping, food prep, meal planning, etc.) I do really love our galley. For being the size of a small hall closet, it's very functional and has a great layout with plenty of counter space. This are is directly across from our galley and is our navigation station, "nav station" for short. 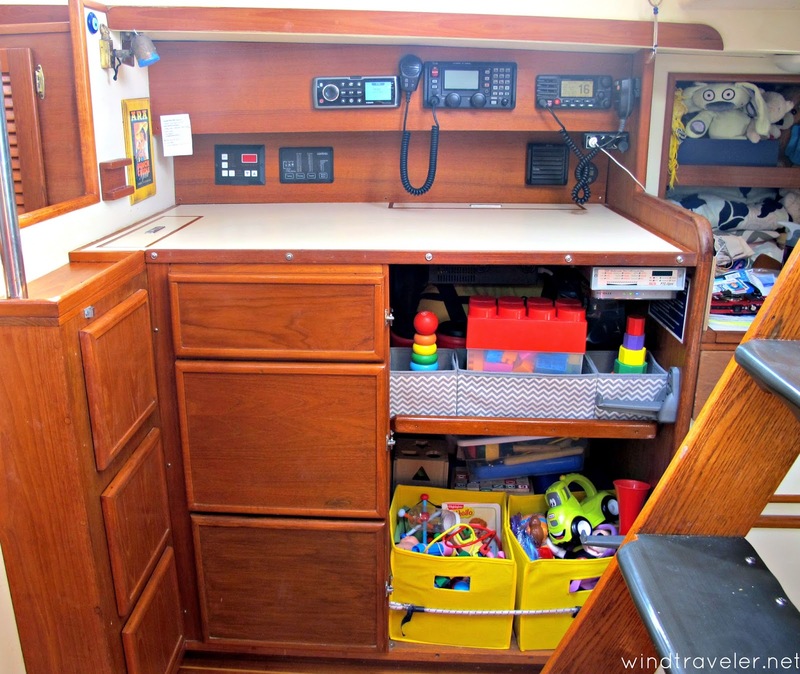 Our SSB radio, VHF radio, FM radio, modem, inverter controls and battery monitor live here. As do all of the children's toys. What you see there is just about all of them, minus the craft stuff which lives in a cupboard. We keep the boat tidy and organized by keeping a policy of cleaning up after ourselves before moving on to the next toy. It works. Sometimes. Either way, the kids can keep themselves pretty well entertained for chunks of time in this area. The drawers to the left are huge and deep and we keep electronics in the top two, and the bottom is a huge file-like cabinet where we store our onions and potatoes. All our cupboards drawers and cabinets latch shut so the boat is more or less baby proof in this way, which is nice. 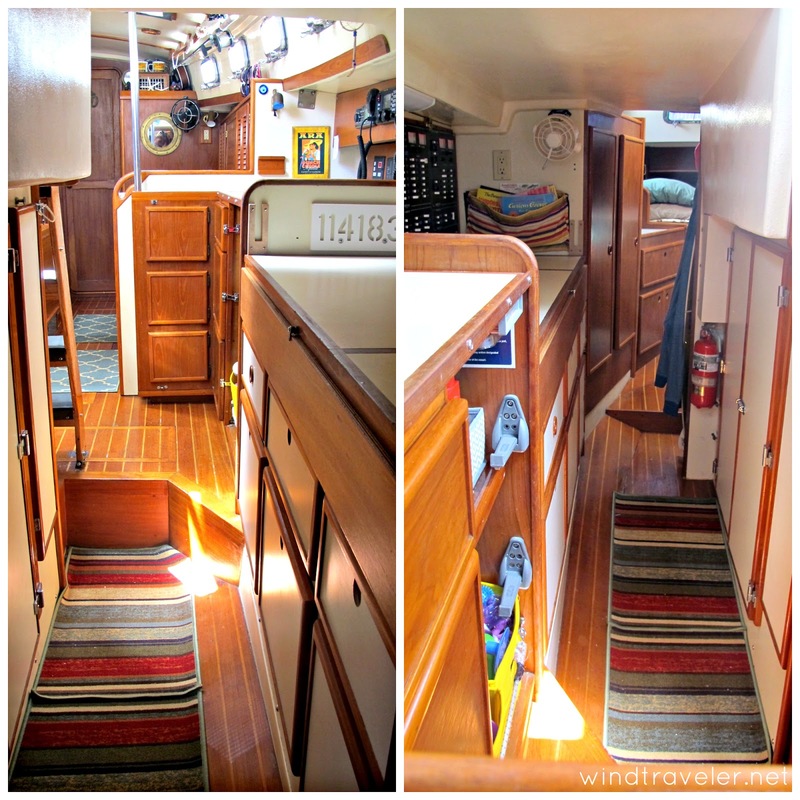 Moving aft beyond our companionway stairs is the walk-thru to the aft cabin. This is also where Isla sleeps, but each day we break down her bunk and stow it because this is also a high-traffic and very functional area as this is where Scott stores pretty much all his tools. You can see the mast steps Scott installed so Isla can climb up to her bunk in the picture on the right. The counter top of this area flips up to expose what has become our sort of "junk drawer". We store all sorts of things from battery chargers to simple everyday tools to charts in this area so we need access to it daily. The large opening doors you see on the port side are our engine room access. Plenty of space to do oil changes and work on our generator and engine. Big bonus. 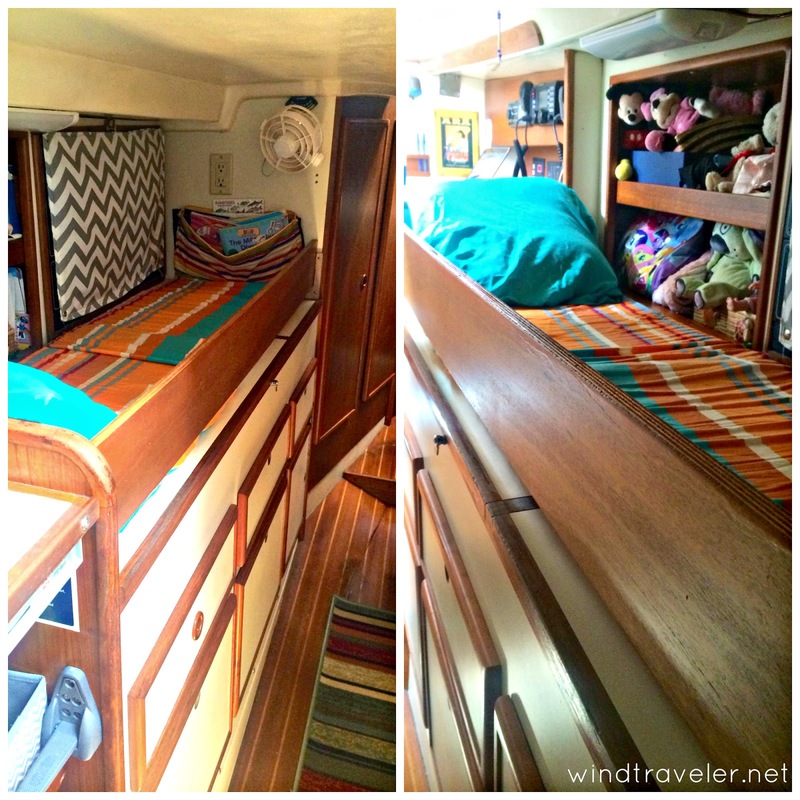 Here's what the walk-thru looks like when it's all set up as Isla's little bunk bed. She loves it up there and the set up and break down takes all of three minutes. Emerging through the walk-thru is our aft cabin, or the master suite where Scott and I sleep. Our bed is more or less king size and the fact that all sides but one are contained mean morning pile-ons with all the girls happen here...a lot. The large top drawer you see in the center is where all of Isla's clothes are. The bottom one is where our air conditioning unit lives. The mirrored side cabinets are more clothing storage. This is our aft head or "bathroom". It's pretty small and cramped and if I am to be honest it's my least favorite room on our boat, but it works. And, hey, it's a bathroom so big deal. 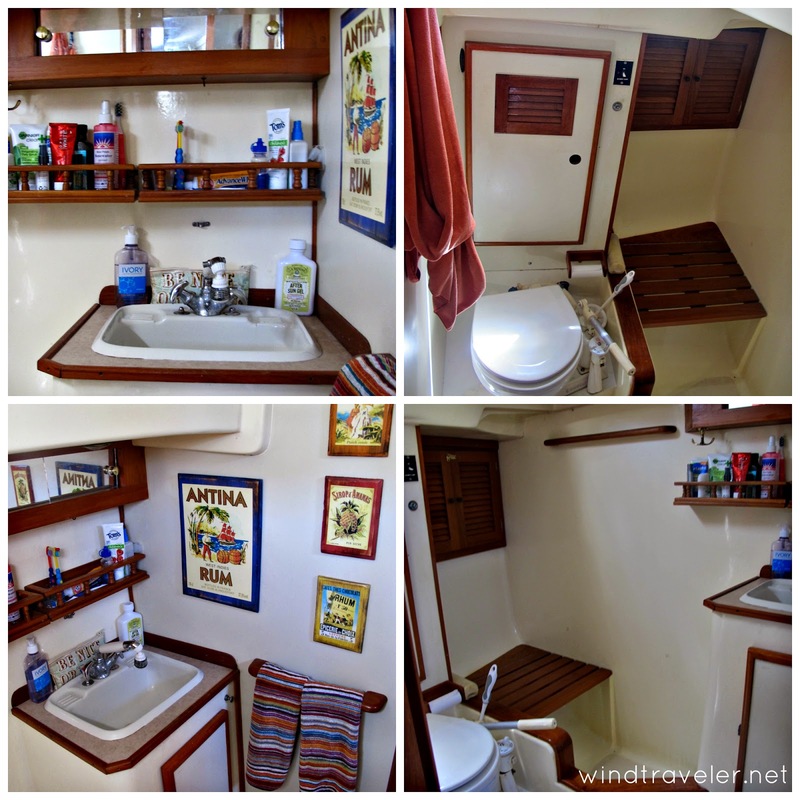 We have a separate sit-down shower stall which we hardly ever use (we chose to shower off the back of our boat unless we are at a marina) and it works well enough when we need it. Not much more to say about this room. Lots more storage, blah blah blah. And here is our cockpit where we spend a huge amount of our time. It's our front porch, back porch and living room all in one. Ours is pretty spacious, super comfortable and kind of perfect for little ones. We love it. The views are great. So there you have it, our boat from front to back. Hope you enjoyed this glimpse into our home! Thanks for the walk thru! Your cozy home looks great! Love all the color! We are redoing our cushions this summer and when I read about your vinyl cushions it got me thinking. I'm still trying to decide what to do, but the vinyl might be a good way to go. I love the bright look in your salon. It's so cheery! Hope you are all well. Give the girls hugs! Love the organization you have set up for the three wee ones. 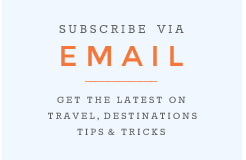 Do you have a post avail with DIY projects for toy organization/library/school? Your organizational saavy may very well translate to helping us organize all of our music gear and instruments. I would love to check it out...help! is the ultrasuede hot? Does the Vinyl stick to your bare legs? I am looking for new fabrics to cover the cushions in our new boat. Yea for new projects! Loved the tour! The colors are so cheerful - just delightful! And, yes, you must have cleaned up before taking the photos - your boat looks immaculate! I inspected your galley for organizing tips! Thanks for sharing. Great decorating! Note to person redoing cushions. I did ours on the last boat with Sunbrella Upholstery. Not pleased. Our new boat has vinyl, which is subject to making bare legs sweat, but a light towel will fix that. Carly, where did you get the laminated artwork you have in your aft head? I can't even figure out what to call it to google it and I love it. It's the perfect pop of color and the right size, to boot. OOps, I meant Brittany. Was reading something by Carly right before I posted. So sorry! what do you think is it possible that humans try to explore the river or sea horizons and reach to middle of it for creating homes. Necessary because it is the requirement, well here I would like to say perfect classic adorable interior work done and lest have discover the Chairthrone for perfect sitting comforts. 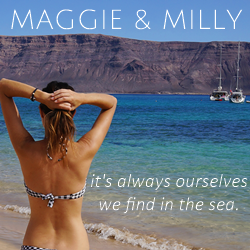 Love it top read and visit again for more read. Keep posting.